Thank you to everyone who entered our latest competition. The winner of the competition has been drawn using random number generator. Congratulations Maryanne. I’ll be in touch shortly to send out your prize. If you missed out this time be sure to visit again soon for your chance to win more great giveaways. Don’t forget, you can also read a free sample chapter of Merrow here. Congratulations to all these fantastic authors and illustrators. We’d also like to make a special mention to Mark Norman for having three books shortlisted! Features stimulating presentations, panel discussions and performances by leading authors and youth literature specialists. Find out more details by reading the Conference Schedule at the State Library of Victoria website. Ananda Braxton-Smith is the author of Merrow and Tantony. Audiences have described Ananda as a writer of ‘exceptional beauty’. 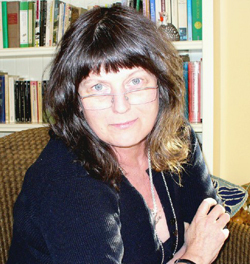 She spends an enormous time researching for her books, incorporating Manx language and mythology into her unusual tales. New Zealand based author, Denis Wright, is the author of the outstanding novel, Violence 101. This highly acclaimed YA book gives a shocking and fascinating insight into the violent mind of a fourteen year old boy in a juvenile prison. To celebrate the release of Ananda Braxton-Smith’s latest novel, Tantony, we are giving readers a free sample chapter of Merrow, the first book in The Secrets of Carrick series. Just click on the image link and download pdf to read sample chapter. Remember, each book is a standalone novel set on the same medieval island of Carrick, so you do not need to read Merrow to be able to follow Tantony, but these books are definitely enriched when read as a series. We found my brother in the skybog. It was me that found him. Boson Quirk is dead, face-down in a bog of stars. 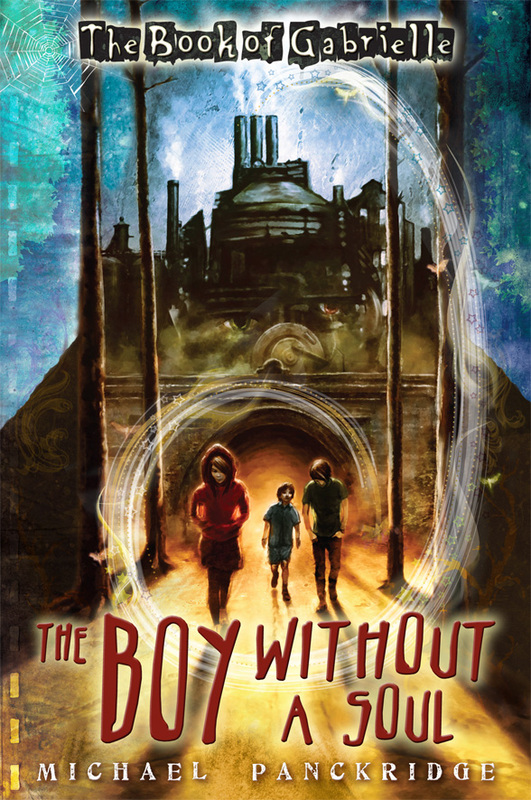 Almost everyone in Carrick said that the boy was a monster, and now Fermion is sure that the townspeople are looking sideways at her, wondering if she’ll go the way of her cursed, mad twin. When a new voice rises inside her, Fermion begins to wonder the same thing. The voice tells her that the answer to Boson’s Affliction lies on the Other Island, the one that everyone says is bristling with gods and monsters. But what waits for her there? Surely it is madness to pursue the answer? 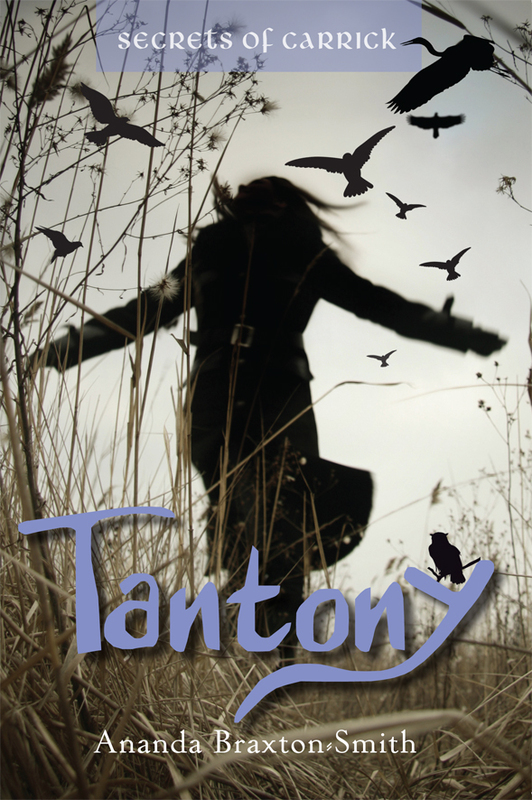 Tantony is the fantastic new novel by Ananda Braxton-Smith. Ananda’s debut novel, Merrow, wowed critics with a shortlisting for the Aurealis Awards (winner announced tonight) and longlisting in the 2010 INKY awards. Merrow is also a CBCA Notable award-winner and we think that Tantony lives up to all expectations! For you chance to win a copy, all you have to do is tell us a Manx word and its meaning. Hint: Read our Ananda Braxton-Smith Interview for ideas. The winner will be announced next Thursday 2nd June. Good Luck! Over the last month some of our favourite Black Dog authors have been busy sharing their love of literature with their fans, young and old. 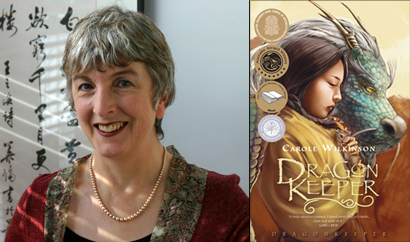 Carole Wilkinson spent three days in sunny Brisbane visiting schools and discussing her best-selling Dragon Keeper series with students. 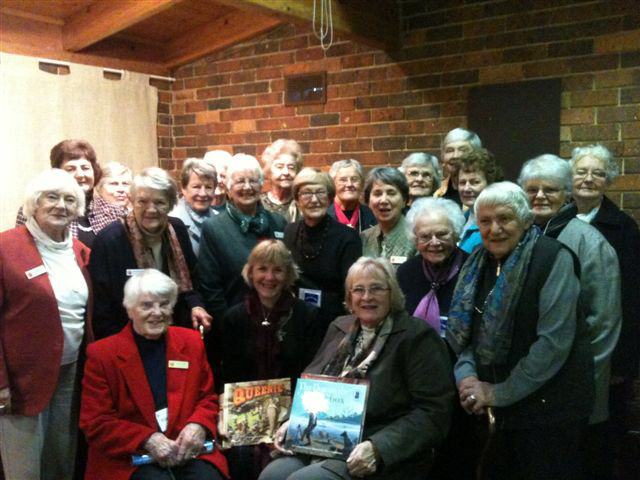 Meanwhile in Melbourne, Corinne Fenton visited the Nunawading Ladies Probus Club where she accidently sold her personal copy of Queenie! Ananda Braxton-Smith made a special guest appearance on 3mdr radio and discussed the inspirations behind her latest novel Tantony. Michael Panckridge visited Jeffrey’s Bookshop to launch his spooky new series, The Book of Gabrielle. For your chance to meet Black Dog authors, be sure to sign up to our newsletter (sent monthly) to keep updated on all our great author events and new releases. Welcome to the second part of our Ananda Braxton-Smith interview. Click here to read Part Two of the interview. I noticed at the beginning acknowledgment of Tantony, that you thanked your mother for teaching you to listen to the voices. Would you share with our readers a bit more about what that means? On ‘Inside’ and ‘Outside’ Voices: A person is born and before they’ve had a chance to look about and decide anything, they’re being told How It Is in the world. All the rules and decisions have been made before we were even thought of. When we’re growing up, and afterwards too, there are many voices outside of ourselves telling us what is right, what we should think and feel, and how to be. They are not just friendly suggestions, they can feel like commands. They are loud insistent voices, coming from the TV, magazines, songs, teachers, parents, holy books and churches, and even from our friends. They often do not match what we really think and feel, or what we feel is right. Sometimes we agree with these outside voices. But plenty of times we just pretend to agree with them. We do this because we want to belong. People like to belong. And we don’t want trouble. Disagreeing out loud can bring you big trouble. We can be bullied, teased, excluded, mocked and sometimes even shouted at and frightened. Sometimes it is quite useful to pretend we agree, like when we don’t really like our friend’s new haircut and they ask us what we think. It’s only a haircut, right? It only matters that our friend is happy with it. We can pretend to like it without feeling bad about ourselves. But other times, like when we lie about what we really believe or feel, it’s destructive. It makes us sad and angry. We are sad and angry because we are lying about our true selves, and people cannot be happy when they are lying about their true selves. Sometimes people even start to believe their own lies, and then they get a bit mad as well as sad and angry. We all have a small, quiet voice inside that tells us what we really feel. My mother taught me to listen to myself, to that inside voice, in a few ways. First, she herself never gave in to opinions she did not believe in. Even if everybody else in the world was of that opinion, she’d just say, ‘Well, they’re all wrong, then.’ And that was that. It was sometimes maddening, but it was also a good lesson in being true to yourself. Remembering that has often given me the strength to withstand other people when they found I didn’t agree with them. Second, she challenged me to explain myself. I had to find my true inside reasons for thinking what I thought. I wasn’t allowed to lazily say something just was: she’d say Why do you think that? I often didn’t like this either but it taught me to discern what I really thought about something, rather than just copying what I’d heard other people say. Three, even if she didn’t agree with me, she made me feel my opinion was fair enough. She gave me the notion that to thoughtfully and honestly disagree was an honourable thing to, and that to cave in to an opinion just because everybody else had was dishonourable. And lastly, she respected eccentric or uncommon thinking in general. She did not belittle unusual thinkers or their ideas. In fact, she loved them. And my mother is a very happy person. Both Merrow and Tantony contain words from the Manx language. Can you tell us a bit more about the Manx language? How did you research it? When I was considering the voice I wanted for Neen, I knew I wanted her capable of both tough plain-speech and of poetry. And I wanted the language to be unfamiliar but not unreadable. I started looking for her name as a way into the way she might talk. First I looked at Irish sites online, but the names were either too difficult for English readers (the spellings!!) or were too recognisable (Declan, Liam, etc, are very Australian names now). Then I tried Welsh, and then Scots. But they weren’t Quite Right. Eventually I found the online Manx-English dictionary. It just popped up when I was searching general Celtic stuff. When I saw some of its words, such as moaney for bog, and sallow for willow, I knew I’d found the right voice. I looked up words I knew I’d use, like daughter, sea, and bird, and found Neen, Marrey, and Ushag, and that was that. I knew I’d found her and her world. The Manx words are unfamiliar words to us, but they have the sound about them of what they mean. And the spelling is mostly recognisable to English speakers. Manx is called a Goidelic Celtic language, like Irish and Scottish. It developed from Primitive Irish, which changed into Old Irish, and then into Middle Irish. About the tenth century Middle Irish was the language spoken in Ireland, Scotland and the Isle of Man. The island was colonised by the Norse about this time, and they left behind some of their words. One of their placenames, Laxey, is a Norse word meaning Salmon River. The Manx were an oral society, which means folklore, history and suchlike was passed on by word of mouth. It was generally not written down, although there was a Bible translated into Manx.During the 19th century English became the official language of the island, and Manx began to be lost. There were some recordings made of the last native speakers. The last native speaker, Ned Maddrell, died in 1974 but since then there has been a revival. In 2001 there were over 1500 inhabitants who had some knowledge of the language. The Manx themselves sometimes call their language Çhengey ny Mayrey, or the ‘tongue of the mother’. After I found the Manx words, I looked further into its lore and history. As well as online resources, I found three books by Kathleen Killip in the Deakin Uni library. They are collections of Manx folklore and stories. From them I got an idea of the particular lore of the island, as well as how the words I got from the online dictionary work in practice. The Manx people have their own forms of English as well as their own Celtic talk. Now I use the Manx online dictionary all the time. I hope I do their words and faery lore justice. I love it, but plainly I’m an outsider so I’m sure sometimes I’d make a native of the island speaker wince. What attracts you to Celtic mythology and history? Well, I guess the simple answer is that it’s my story, my culture, my history, and I have a special feeling for its lore and imagery. I enjoy all myth and legend but the Celtic speaks more to my heart, to my soul if you like, than the stories of other places. And that’s strange because often the stuff of legend is the same all over the world. Sea-dwelling folk, such as the merrows for instance, exist in just about every country’s story-hoard. So there must be something in the language of the telling that I’m responding to as familiar, something in the rhythms and the music of the telling, that touches me … quite apart from the subject matter of merrows, sea-monsters and so forth. Do you have a Celtic background/ancestry? Oh, yes. England, Scotland, Wales. And Germany. Plus some Italian to add heat and colour. Why is the sea/ocean setting quite prominent in both Merrow and Tantony? The sea is the perfect metaphor for just about everything; it’s always moving, it has a reflecting surface, a light-filled middle section and dark deeps. Landlife, including us, cluster around its edges, while its own sealife is monstrous, beautiful and alien. It has forests but not of trees, warm-blooded mammals pretending to be fish and even singing in the cold depths, and fish with lamps on their heads that live in blackness. It can give us dinner, seaside holidays and adventure and also, wrecks, tsunamis and death by fang or stinger. It is the classic Other-place, where anything might happen. What’s not to like? Will there be any more books in the Secrets of Carrick series? I am researching the third one now. It’ll be set in the southern settlement of Market-Shipton. (And a question just for fun) If a movie was made about your life, who would play you? Be sure to visit again soon for your chance to win a copy of Tantony. We’re incredibly excited to be publishing Ananda, and hope that you’ll love her writing as much as we do. Ananda’s debut novel, Merrow, (released in 2010) has been a great success, and is a CBCA Notable award-winner. It was also shortlisted in the Aurealis Awards for young adult fiction (winners announced May 21) and longlisted for the 2010 Inky Awards. In this interview Ananda discusses her latest novel, Tantony, the second book in the Secrets of Carrick series. What inspired you to write Tantony? Toward the end of Merrow Ma Slevin says, ‘Have you heard about the twins down at Strangers Croft? Poor little mites.’ Well, the thing is, I made myself very curious about those twins. What could have happened that they were talked about right away up on the northern cliffs? Who were they? What had happened to them? Tantony is a result of that curiosity. Also, I wanted to write a bog story. Some of the best stories have happened on bogs. And Carrick’s word (from the Manx) for the bog is the moaney … it’s such a great word. The sound of it started me thinking about sad stories and little lost ghosties drifting about in the mist, making sorrowful noises and so forth. What is your favourite part of Tantony? Well, as usual I really loved writing about the creatures; up on the bog there’s the gembugs and specklemoths and all the remarkable birds. Not to mention the family, the Quirks themselves, who are a type of bog creature all of their own. But my favourite parts of the story itself are the scenes with Fermion and Boson as he goes madder and madder and she tries to keep up with his ideas about time and angels. I love her irritability in these bits. Did Tantony change much between the initial idea and the final book? Not much, really. The general sweep of the whole story was there in the initial idea, but I had no idea about the details until I was in it. This made writing it somewhat hairy. What were you reading while writing Tantony? What were your influences/ inspiration while writing? I read a lot, for research and encouragement. I always do. I’m always reading, and it’s all research. For Tantony, I first read the long early English poem ‘Beowulf’ (Seamus Heaney’s translation). It’s set in a bog, and has a monster at its heart. There is a little homage to it in the section where Boson is being chased by the towny boys. I also read Understanding Wetlands: Fen, Bog and Marsh. Very helpful non-fiction book by SM Haslam. The legend of St Brendan the Navigator, in many versions. In the legend, Brendan sails the Atlantic in a leather boat and has many adventures. One of my most influential discoveries was that the saint and his comrades were not happy sailors. They went unheroically ‘wailing and gnashing their teeth’ into their sea journey. It gave me heart to write my unheroic hero as she traveled her own whale-road into her fears. Also, I read the Celtic Book of the Dead, in many versions. This tells of the journey the Celts believe they were to take after death, journeying through the western isles where they met with many trials, and leading at last to their paradise. Parliament of the Birds, by Farid ud-Din Attar. Beautiful long Persian poem written in 1100s, all about the journey of a group of birds. Monsters, Marvels and Miracles: Studies in the Medieval and Early Modern Imagination, edited by Timothy S Jones. This gave me a glimpse into what scared and excited the people of the Middle Ages. Funnily enough, it was very much like what scares and excites us today, but with a bit more religion. Plus I read lots of books of Manx folklore, mostly by Kathleen Killip, and the collections of Irish myths and legends collected by the poet WB Yeats and Lady Gregory (Oscar Wilde’s mum). Are any of the characters based on real people / people you know? That is a hard question. Nothing comes from nothing. It all has to come from somewhere. I confess to using everything. From my life, from other people’s lives, from stories I hear second and third hand, television, newspapers, songs, dreams and other people’s books. Anything that works. But it doesn’t resemble itself anymore after I’ve used it. It goes through some alchemical change on the way into the story. There are real events in Tantony, and references to people I’ve known … but it all goes through such a heavy fictionalising process before it comes to the page that it’s not recognisable any longer. Even to me. It’s one of the mysteries of writing fiction. So, the answer is yes … and no. Tantony is the second book in the Secrets of Carrick series. Will readers need to read Merrow first to be able to follow Tantony? No. The books are not serialised in that one leads into the other. The stories all happen at the same time, on the same island, over one summer. They enrich but do not depend on one another. They are each self-contained novels. So far, Merrow is set on the wind-blasted northern cliffs, and Tantony on the western edge of the island’s bog, near the deserted settlement of Stranger’s Croft. Tomorrow we bring Part Two of this interview. Also be sure to visit again soon to win a copy of Tantony. Ananda’s debut novel, Merrow, is a CBCA Notable award-winner, and Tantony lives up to all expectations. Inhabiting the same world as Merrow, and set on the medieval island of Carrick, Tantony is a standalone tale infused with the drama of gothic literature and magic realism. Praise for Merrow (Book 1 in the Secrets of Carrick series). The Book of Gabrielle series continues this month with the release of this second title. Still haunted by the mysterious Voice, and the knowledge of her strange gifts, Gabrielle begins the year at a new school. She befriends Michael and his younger brother, Jack. But something is very wrong with Jack. Can Gabrielle help Michael discover the truth behind his strange – and possibly deadly – little brother? Join Gabrielle as she unravels an exciting new mystery and more secrets are revealed about her past. Praise for The Boy Who Wasn’t There (Book 1).